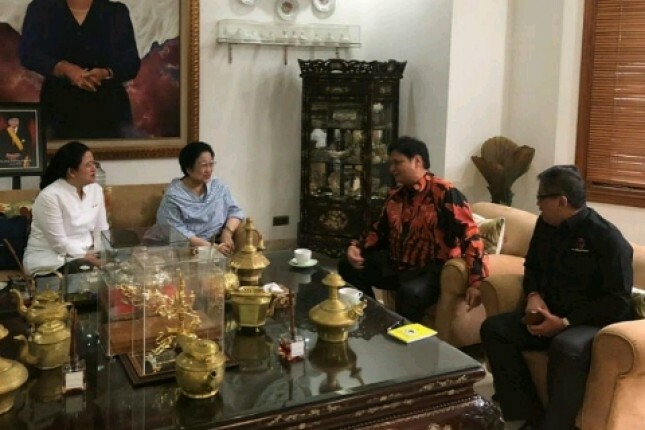 INDUSTRY.co.id - Jakarta, Minister of Industry who is also Chairman of Golkar Party Airlangga Hartarto held a meeting with PDIP Chairman Megawati Soekarno, Monday (16/7/2018) yesterday. The family-run meeting at Megawati Soekarno Putri's residence on Teuku Umar Street, Menteng, Central Jakarta, specifically discussed the coalition of the two parties and the vice-presidential candidate Joko Widodo in the 2019 presidential election up to the discussion of the 1945 amendment. On the occasion Ketum PDIP Megawati Soekarno Putri accompanied by PMK Minister Puan Maharani and PDI-P Secretary General Hasto Kristiyanto. The special meeting conducted by Megawati and Airlangga lasted more than 2 hours and discussed various national strategic agenda forward. "Golkar and PDI Perjuangan have long historical roots. The combined strength of both, not only strong in the House, but able to ensure the effectiveness and stability of the government in the future. Especially cooperation Golkar and PDI Perjuangan is done before pilpres, and this will strengthen the way of victory Pak Jokowi ", said Airlangga. Meanwhile, PDI-P secretary general Hasto Kristiyanto said that every political party, in carrying out the normal leadership cadre function, should strive for the Chairman in a strategic position at the national level. "Megawati's mother as Chairman of the PDI-P in 2014 is also much encouraged as a presidential candidate, but he listens to the aspirations of the people and prefers to mandate and nominate Mr. Jokowi. Same with Golkar, Mr. Airlangga is a representative of Golkar, has extensive experience, and leadership has been tested since the time of the students. Her leadership also embraces and builds dialogue. So PDI Perjuangan very understand if Golkar nominate Mr. Airlangga to accompany Mr. Jokowi, because it is an aspiration of his party to encourage his cadres, but of course it will be dialogued together. To be sure, the meeting is very conducive and many of the fundamental issues discussed related to the cooperation of both parties today and in the future, "said Hasto. Not only had that, on the occasion also discussed about the long history of cooperation Golkar-PDIP. Megawati, Hasto said, was excited when Airlangga also spoke about the history of Golkar and Bung Karno's relations. "On the occasion also agreed on the importance of support to President Jokowi, also accompanied by the agenda of national system and institutional political arrangement to fit the Pancasila as the soul and personality of the nation," said Hasto. It is said Hasto, in the occasion twrsebut, Airlangga also talk about the study of amendments to the 1945 Constitution and efforts to fight for the MPR has authority in the GBHN. Then the statement was taken seriously by Megawati who recounted Bung Karno in the 1960s gathered over 600 doctors and designed the Planet of the Planet of the Universe. "The pattern of the development of the Universe must be re-studied and captured its spirit as the country's direction which describes Pancasila in order that Indonesia is sovereign, self-reliant and culturally," Megawati said as Hasto said. Hasto ensured the meeting was very conducive and many of the fundamental issues discussed were related to the cooperation of both current and future parties. On the occasion also agreed on the importance of support to President Jokowi, also accompanied by the agenda of structuring the system and national political institutions to fit the Pancasila as the soul and personality of the nation.